I've had a set of the wonderful Brusho crystals for a while and have dabbled here and there with a few backgrounds for cards.. but I decided to have a go at a proper painting. This is a small painting to fit on a Birthday card I made for my daughter - she loves the Van Gogh Almond Blossom painting and even bought herself a print of it when she visited the Van Gogh museum in Amsterdam..
First of all I printed a copy of the picture that I found online at the size I wanted for the card.. then I used some Trace down to make a rough outline just to mark out where the main branches are onto watercolour paper filling in the details with a pencil, once I was happy with the pencil drawing I went over it with masking fluid. Once that was dry I wet the watercolour paper all over and sprinkled 4 various shades of blue Brushos and then misted it with water to blend even further. 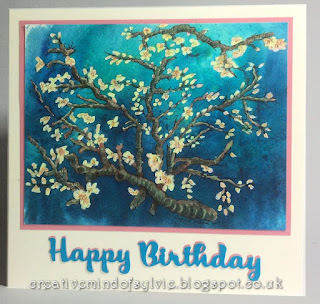 I dabbed with tissue where to wipe the excess water.. after drying it with a heat gun and it was completely dry, I rubbed off all the masking fluid..which left pure white areas to fill in the designs for the twigs and blossom. I used Brusho crystals mixed with water to paint it. I finished off when that was dry with a fine liner pen to add a bit more detail... and that's that!.. it was alot easier than I thought it was going to be and I really love the depth that the Brushos bring.